The Fourth Gyalwa Karmapa, Rölpe Dorje, was born in Kongpo province of Central Tibet. While pregnant, his mother could hear the sound of the mantra of Avalokiteshvara, Om Mani Padme Hung being sung melodiously in her womb. As soon as he was born, Rölpe Dorje sat up and repeated the mantra. At the age of three he announced that he was the Karmapa, and throughout his childhood he manifested a continuous stream of extraordinary enlightened activity. Many profound teachings were revealed to him in his dreams and he was able to read without prior study. At the age of twelve, having been recognised as the Fourth Karmapa by Rinchenpal (as predicted by his previous incarnation), Rölpe Dorje was travelling to Central Tibet when he met Yungtönpa. Yungtönpa recognised the young boy as the Fourth Karmapa, due to Rölpe Dorje’s remarkable ability to clearly recall many episodes from his previous life as Rangjung Dorje. Rölpe Dorje also recognised all the belongings of his predecessor and was subsequently enthroned as the Karmapa. Yungtönpa then bestowed upon the Fourth Karmapa all the teachings, empowerments and transmissions of the Kagyu and Nyingma lineages. During that time, Toghan Temur was the last Emperor of the Greater Mongolian Yuan dynasty and had been a disciple of the Third Karmapa. He invited the Fourth Karmapa, then nineteen, to return to Daidu (modern-day Beijing) in China. Rölpe Dorje taught for three years in China, establishing many temples and monasteries both there and during his travels. The subsequent Emperor of the Ming dynasty later invited the Karmapa to China, but Rölpe Dorje declined, sending another lama in his place. During his return to Tibet from Daidu, Rölpe Dorje gave lay ordination, and the name Kunga Nyingpo, to the child whom he predicted would play an important role in the Buddhism of Tibet. The child was to become known as the great master Tsongkhapa, the founder of the Gelugpa school. As can be seen from his many wonderful dohas (songs of realisation), the Fourth Karmapa was an accomplished poet, and he showed a love of Indian literature. After one of his students had a vision of a 300 foot tall Buddha image, Rölpe Dorje traced the outline of the Buddha’s image with the hoof prints of a horse he was riding. The design was subsequently traced on cloth, and it took five hundred painters a year to complete the huge thangka of Lord Buddha, Maitreya, and Manjushri. The Fourth Karmapa passed into Parinirvana in East Tibet at the age of forty-three. He had many close disciples, including Lozang Dragpepal, Rinchenpal, Karma Könchok Zhönnu, Tsurphu Kungangpa, Tsokarwa, Yeshepa, Chökyi Gyalpo, Öser Lama and Kunga Dorje. 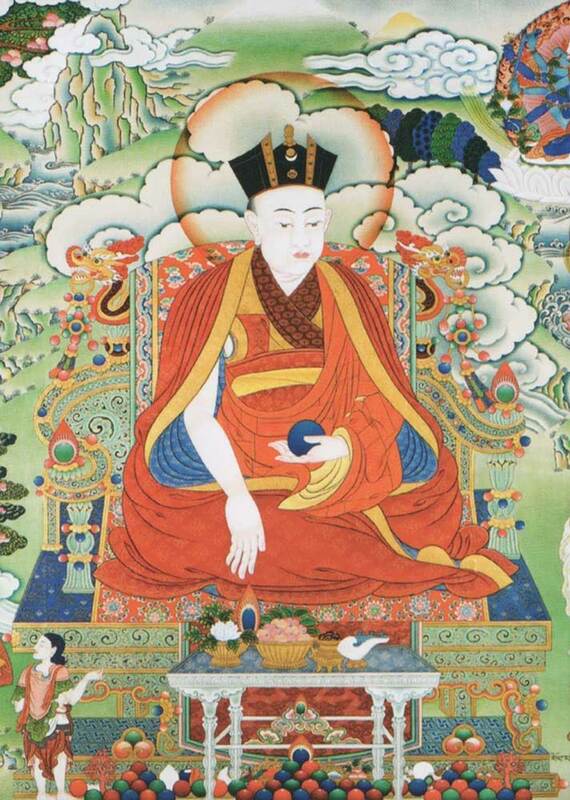 However, it was Khachö Wangpo, the Second Shamarpa, who became the main lineage holder.